You will be delighted with the price and amount of living space and amenities this beautiful traditional home has to offer! Built in 2005 and nestled on ¾ Acre lot, at the end of a quiet cul-de-sac in one of Orlando-Windermere’s prestigious gated communities, Waterford Pointe! A sweeping circular drive under an old Oak tree leads to the front door with insets of beveled lead-cut glass and side lights. 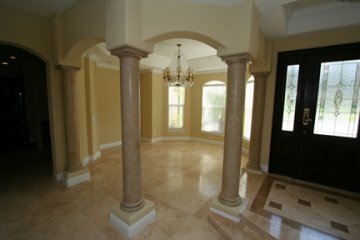 The floor plan is open and inviting with only stately columns defining the formal living room and dining room. No neighbors in back – just a lush greenery to enjoy! 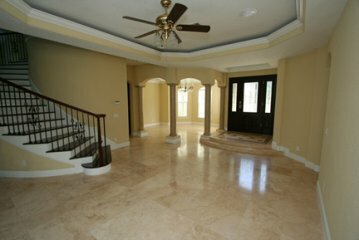 The home is family friendly with tile in all the traffic areas. 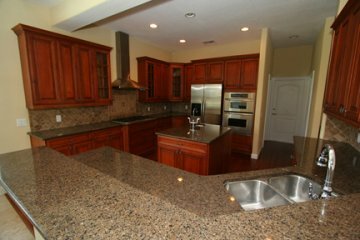 The Kitchen is warm and inviting with rich cabinets topped with gleaming granite and floors of handsome wood and stainless appliances. 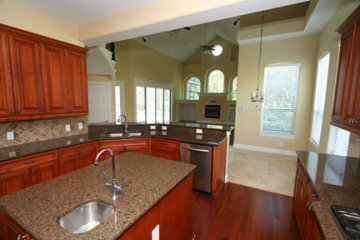 The Kitchen boasts a granite Snack Bar which opens to a Family Room with soaring ceilings, an entertainment center with room for large screen T.V. 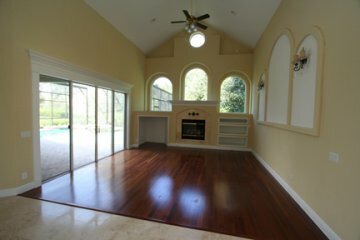 and 12’ sliding glass doors opening to a large screen enclosed area. 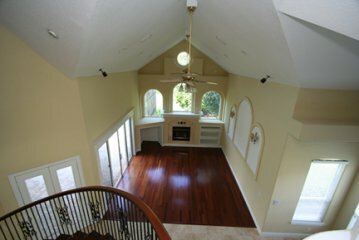 The home features 5 bedroom suites and possibly 6 bedrooms if you choose to use one of the remaining rooms as a bedroom. 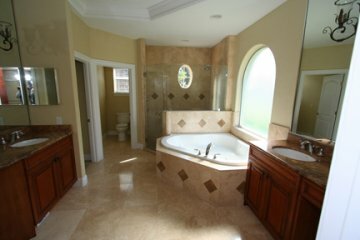 The 25’ Master Suite with spacious adjoining Bath, his and hers closets, a spa tub and separate shower , as well as a separate Study with a beautiful bay window are located on the first floor! 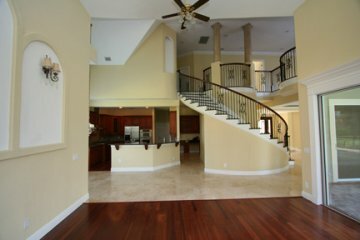 A dramatic open curved staircase, banded in iron railing, leads from the formal Living room to the second level where there are 4 additional Bedrooms Suites, a Bonus Room with warm wood floors and a 20’ Balcony, a 25’ Game Room with a Bath, and a wonderful spacious 17’ “Extra” room which could be a Children’s Play Room or a Computer Room. This could be a nice air-conditioned storage space as well! 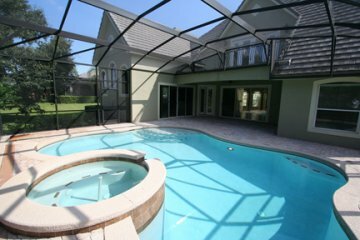 In addition to all these wonderful features there is a 24’ brick Terrace, Pool and heated Spa in a large screen enclosure. Also a 4-car Garage! Owner has priced this home for prompt sale.